On this date in 1940, 250,000 soldiers of the Italian Tenth Army under the com­mand of Marshal Rodolfo Gra­ziani crossed from the Ital­ian colony of Libya into Egypt (see map), where British troops were pro­tecting the Suez Canal, the vital water­way to the Middle Eastern oil­fields and beyond that to Brit­ish holdings in India, Burma, Singa­pore, and Malaya. Four months earlier, on June 10, 1940, Italian dic­tator Benito Musso­lini had declared war on Great Britain and France. Gra­ziani’s incur­sion into Egypt was Italy’s first offen­sive against British forces in North Africa. The Tenth Army halted 60 miles inside Egypt and dug in. Only 30,000 Brit­ish defenders were available to chal­lenge the inva­ders, so the Ital­ian halt was likely due to their being largely unmecha­nized and un­aware of Brit­ish strength, as well as the poten­tial of the Royal Navy to inter­fere with Ital­ian supply lines in the Mediter­ranean region. Nearly three months later, on Decem­ber 8, 1940, the Brit­ish Middle East Com­mand, composed of Brit­ish, Indian, and Aus­tralian troops under Gen. Archi­bald Wa­vell, launched Opera­tion Compass (Decem­ber 8, 1940 to Feb­ru­ary 9, 1941). Orig­i­nally planned in great sec­recy as an ex­tended raid, Com­pass suc­ceeded in cap­turing tens of thou­sands of ene­my troops. The Tenth Army was vir­tually destroyed, and it seemed that the Ital­ians would be swept from North Africa. At that cru­cial mo­ment, how­ever, Brit­ish Prime Minis­ter Winston Chur­chill ordered the ad­vance stopped and troops dis­patched to defend Greece, which Mus­so­lini’s armies had in­vaded on Octo­ber 28, 1940, from Ital­ian-occupied Alba­nia lying on Greece’s north­ern fron­tier. Mus­so­lini moved quickly to rein­force Ital­ian gar­ri­sons in West­ern Libya (Tripoli­tania), bringing troop strength up to 150,000. Weeks later, in Feb­ruary 1941, the nucleus of the Ger­man Afrika Korps led by the energetic young Gen. Erwin Rom­mel arrived in Libya to rein­force Adolf Hitler’s Axis partner. Neither the Ital­ians nor the Ger­mans would be finished off until mid-May 1943, when their armies stood down and sur­rendered to the Allies, whose pre­sence had been strength­ened by the Torch landings in North­west Africa in Novem­ber 1942. More than 250,000 Ital­ian and Ger­man prisoners were taken, which ended the Axis threat in North Africa. Above: Map of Cyrenaica, Eastern Libya, and Western Egypt, 1941–1942. Left: Approximately 25,000 Italians defended the important har­bor town of Tobruk in Cyre­naica (exact cen­ter in above map). 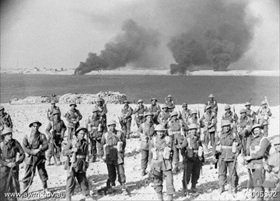 After a twelve-day period building up forces around Tobruk and softening up Ital­ian defenses with heavy artil­lery bom­bard­ment, Aus­tralian, Brit­ish, and Free French units took the town one day after launching an attack on Janu­ary 21, 1941. The Tobruk prize yielded over 25,000 prisoners, 236 field and medium guns, 62 tan­kettes, 23 M11/39 medium tanks, and more than 200 other vehicles. Right: British Vickers Mark VIB light tanks on desert patrol, August 2, 1940. First produced in 1936 for the dual roles of recon­nais­sance and colo­nial war­fare, the lightly armored Mark VI pos­sessed a crew of three—commander­/radio opera­tor, gunner, and driver. Its main arma­ment was a .50-in Vickers machine gun. 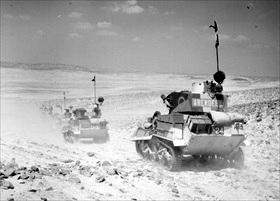 In a Decem­ber 12, 1940, attack, the light tanks got bogged down in salt pans and were severely mauled by the Italians. Left: Like the lightly armored Vickers Mark VI tank, Italy’s Fiat L3 tan­kettes were machine gun-armed. First built in 1933, L3s and their variants carried a two-man crew and were mainly used for light infan­try support and recon­nais­sance. They saw service against Haile Selassie’s army in Ethi­opia (1935–1936) and in Spain, France, the Bal­kans, Libya, and Italian East Africa. 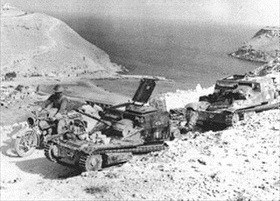 In this photo an L3 cc on the left and an L3/35 on the right are shown here on the harbor road overlooking Bardia, Libya. Right: Operation Compass was a complete success. Allied forces advanced 500 miles from in­side Egypt to cen­tral Libya, suffering just over 1,700 casu­al­ties and capturing 130,000 Ital­ian prisoners, including 22 generals. The Ital­ians lost 400 tanks, nearly 1,300 artil­lery pieces, and a thou­sand air­craft. 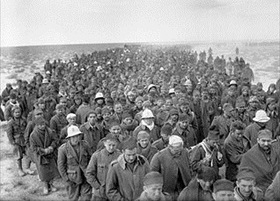 In this photo from Janu­ary 6, 1941, a column of Ital­ian prisoners cap­tured during the assault on Bar­dia, Libya, is marched to a British army base.